I feel like a fantastic Euro-fotog posting this image. Wildlife Photographer of the Year, here I come! Seriously though, isn't it interesting how common this technique of shooting through foliage to create dreamlike blurry-edged wildlife portraits is among the European photography community, and how it doesn't seem to be utilized nearly as much elsewhere (like here in the United States)? By the way, please don't take that the wrong way. I admire those guys. I admire the hell out of them. It's an inspiring, beautiful, and artful technique. Here is my humble contribution. 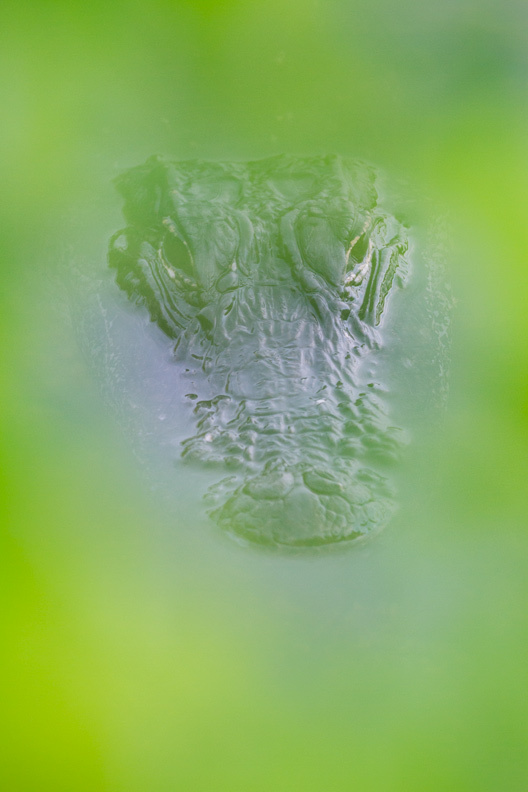 "Lying in Wait" - An American alligator peers through foliage at water's edge. Everglades National Park, Florida. About the image: By using a relatively long 400mm lens with low depth of field I attempted to create some kind of primal fear within the viewer as if the alligator were hunting them. I quite like gators, so it doesn't really work on me, but then I like snakes too. Weird, I know. Anyways, I carefully selected an aperture of f/10 here to keep the foliage out of focus, while trying to get as much depth of field as possible so that at least some of the snout was reasonably in focus. If I had shot this image at f/5.6., the nose would have been much softer. Unacceptable soft. Additionally, the foliage would have been more uniformly green without the subtle changes in tone that is made possible here by bringing them in focus just a touch with a slightly smaller aperture. Techs: Canon 7D, Canon 400 f/5.6. 1/50th second, f/10, ISO 800. Tripod. All images © Chris Kayler.